So a second Sky+ remote control beats the dust. It lasted only 2 weeks and was still in *mint* condition. I never saw the carcass as the wife hid it knowing it would make my poor heart racing. No wonder due to all the sweat that was put into purchasing it at a local Maplin's shop. A sweaty shop with sweaty carpets and even sweatier customers. The first remote control at least lasted 1 year which I was quite content with. 2 weeks is however not acceptable so this family will simply have to do without. The family is however allowed to use the amplifier multi-control which was conveniently programmed for Sky+ before the destruction. 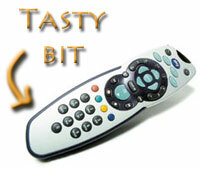 A small call out to Sky to make their remote controls less appetizing. I guess tastiness was something that was overlooked in the design process. The black rubbery part of the remote seems to be simply irresistible for dogs..
Maybe I should have a taste next time! This entry was posted at 04:24 PM.